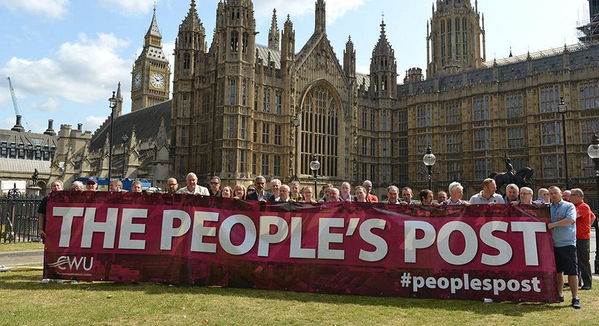 On Tuesday 19th of July the People’s Post campaign will once again be visiting Manchester. This event followsÂ the enormous success of our People’s Post rally which was held at Manchester Cathedral in October last year. This rally saw 10,000 pack the inside and outside of the building to hear from CWU General Secretary Dave Ward, Leader of the Labour Party Jeremy Corbyn, leader of the Green Party Natalie Bennett, political commentator Owen Jones and others on the perils facing Royal Mail and the Post Office thanks to privatization dogma. We look forward to engaging with the people of Manchester and discussing with them the issues facing their postal services, including the proposed closures of Delivery Offices, forced franchisingÂ of Post Offices into the back rooms of W.H. Smith branches, and the threat to six day deliveries and the Universal Service Obligation. 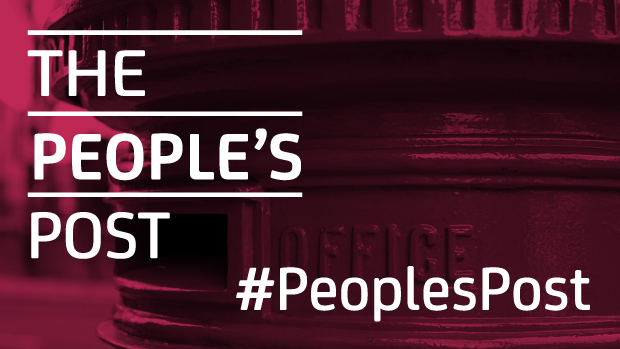 The People’s Post bus will be stopping in Piccadilly Gardens in Manchester City Centre. We will be joined by Tony Lloyd, interim Mayor of Greater Manchester and the region’s Police & Crime Commissioner. The campaign then moves to St Helens. We invite everyone who attends to sign our giant postcard which is travelling from Scotland to London where it will be delivered to the Department for Business, Innovation and Skills (BIS). 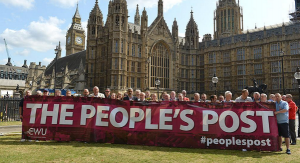 To find out more about the People’s Post campaign please visit the official campaign page here.